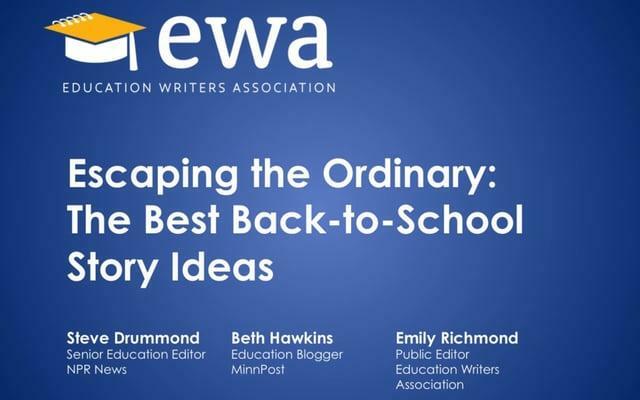 EWA’s recent webinar, Escaping the Ordinary: The Best Back-to-School Story Ideas, featured three veterans of the education beat giving away their trade secrets. These are award-winning, hard charging scribes and editors dispensing invaluable information. While your best bet is to view the full hour-long video replay to hear all of their insights, below we highlight some of the key takeaways from the webinar. Steve Drummond, who heads the education desk at NPR, urged listeners to avoid neglecting important segments of the student population. Finding foster and homeless students may reveal a lot about the support systems in place at the districts and colleges you cover. Speak to these students or the organizations committed to helping them. The transition story is also a powerful way to draw readers into the swirl of education issues without overwhelming the reader or listener with studies and policies. Kindergarten is an important year for many students, particularly disadvantaged learners. Third grade is when students stop learning to read and begin reading to learn; it’s also when students’ attitudes toward school can begin to sag, Drummond said. Capture the student, teacher and parent voices to offer texture and emotion to stories that are often presented in scholarly reports unavailable to the public. If a student is to drop out, it’s likely in the ninth grade. Find ways to interview the players trying to retain as many students as possible, Drummond added. And while you’re at it, speak to the rookies – teachers, principals and other staff who are new to their jobs. What are their fears? What do they hope to achieve? Another idea: Do teachers in your coverage zones plan to tackle divisive issues in the classroom? Drummond cited a book, “The Political Classroom,” that explores the ways in which the classroom experience can expose students to different viewpoints and provide an opportunity to explore ideas with which they disagree. Are teachers themselves willing to talk about police profiling, abortion, foreign policy or the national election? Beth Hawkins, an education reporter at MinnPost, (an independent online news site) stressed data collection during her webinar presentation. City- or state-level data sets with accompanying articles drive traffic and can expose incongruities in policy or law. Hawkins and her colleagues created a database of high schools in Minnesota and rated them by how many of their college-bound students required remediation in college. Schools with high graduation rates, even ones singled out as among the best in the United States, at times had a fifth of their students enrolled in remedial education courses at the college level. In other instances, high schools touted for beating the odds with high graduation rates and mostly low-income students were sending students to colleges who needed remediation in large numbers – sometimes more than half of students. That data can propel multiple articles, including profiles, follow-ups and even editorials. MinnPost also created a data set on how much money districts were rerouting to special education programs to fulfill state and federal rules – often at the expense of funding for teachers, librarians and art programs. Can’t build a statewide data set? That’s fine. Hawkins pointed to stories that can be an easier lift. Consider focusing on dual-enrollment programs, in which students can earn college credit while still enrolled in high school. There’s a wide mix of students in these courses, from budget-conscious pupils to talented students who are at risk of dropping out of high school and could benefit from the added motivation. Emily Richmond, EWA’s public editor, who previously covered the fifth-largest school district in the United States (Clark County, Nevada, which includes Las Vegas), stressed creating contacts at schools early. Distribute business cards even before school begins – with teachers, principals and even custodians, she suggested. Teachers will know to call you when things go awry. Principals will have a tougher time saying no to a name with a face. And custodians are often the longest-serving employees of a school, and may dispense savory details. This is a big time for buzzwords, Richmond said: Don’t be afraid to push back and ask district officials to explain what they mean when they talk about “personalized,” “blended” or “student-centered learning,” for example. Find out how well your local educators’ definitions and intent align to what researchers and successful practitioners say are the hallmarks of successful initiatives. And keep an eye on changes in school choice policy, like an unprecedented new law in Nevada that allows most families to tap public dollars to pay for private educational alternatives to their neighborhood campuses, she said. Who’s able to take advantage of options like charter schools or vouchers, she asked, and who’s potentially being left behind because of difficulty with some of the more mundane basics – like transportation. Also, with the Common Core now firmly entrenched in more than 40 states, it’s a good time to ask how the standards are shaping what’s happening in the classroom, Richmond said. While the Common Core is not a prescribed curriculum, there’s no question the new grade-level expectations are influencing the materials and methods teachers choose to use. In many schools, Richmond noted, those decisions are being made by the classroom teachers themselves (or in concert with district curriculum directors). Find out where your local teachers are gleaning their ideas, and if they’re using popular websites for educators like Share My Lesson, Richmond suggested. Finally, spot the teachers doing cool things, either by reading their blogs, following them on social media, or showing up in person. This English teacher taught an American classic, Toni Morrison’s “The Bluest Eye,” by using a curriculum based on social justice and the lyrics of hop-hop ace Kendrick Lamar. The artist eventually visited the New Jersey school. Need comprehensive data to compare your district’s trends to state or national averages? EWA’s guide to using federal data contains numerous links, how-to’s, and summaries of education and workforce data you may not have known about. Also, district-level data on state assessments are due out soon. If your district is one of the more than 20 to take part in the district-level NAEP program for big cities, compare results to get a sense of either the state test’s rigor or how well students performed. You may find the state test results are rosier than what NAEP data show. If they are, ask why.